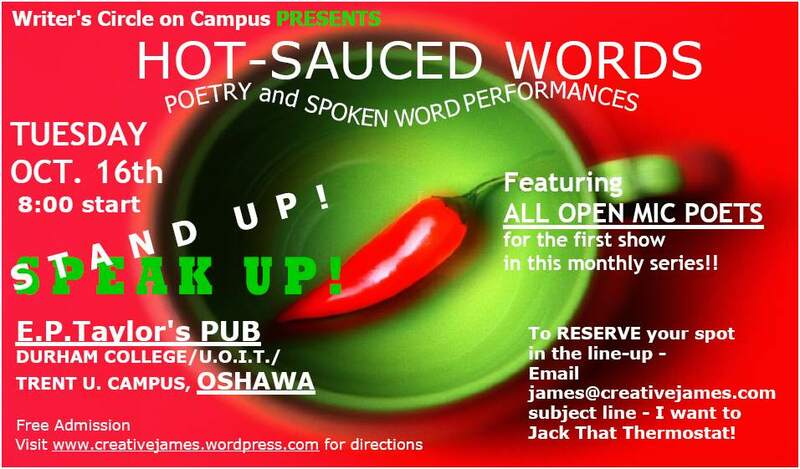 Thanks to the efforts of the WRITER’S CIRCLE on CAMPUS led by the tireless CLINTON DOCHUK, the FIRST HOT-SAUCED WORDS show will arrive on campus OCTOBER 16th at 8:00. AND it’s an ALL OPEN MIC NIGHT! 12 POETS are signed up so far. We have room for 5 more. 8:00 p.m. at E.P. TAYLORS PUB in THE STUDENT CENTRE at DURHAM COLLEGE, OSHAWA.